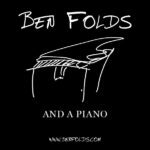 The tour was originally going to be called Ben Folds: A Piano and a Playpen because he’ll be playing an assortment of musical “toys” besides the piano – drums and other assorted noisemakers – hence the playpen. It was found to be a bit confusing, so the “playpen” was officially moved out of the title of the tour but some of the venues and shows might still reflect that name. His shows will feature this kind of instrumental assortment from this fall into next year. Most of the dates include the availability of Master Class and Soundcheck packages. The Master Class, billed as AMAA – Ask Me Almost Anything typically includes the master class in piano technique (with no piano experience necessary), a question and answer session, early entry, meet & greet photo-op at the piano, pre-show cocktail reception, and some nice swag (autographed photo, journal and pen). The Soundcheck includes pre-show soundcheck access, cocktail reception, early entry and some swag as well. Ben is teaming up with local music teachers in each of the Master Classes to talk about his songwriting, the creative process, and anything else related to his music. Single-seat ticket sales open July 15 for most of the shows (a few are later). Pre-sale is open for members or subscribers at the venues as well as fan club members, as are sales fro most of the Master Class and Soundcheck packages. Ben is reportedly planning to head back into the studio in 2017 to write and record another round of songs, this time reaching back to his piano rock roots in the manner of his early solo material.